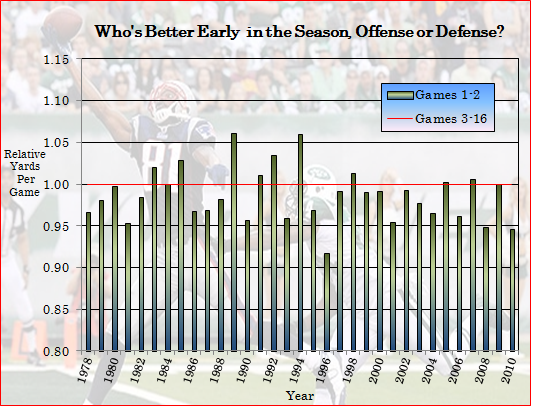 NFL: Does Offense Really Take Longer To Gel Than Defense? The conventional wisdom says that defense is ahead of offense during the early part of the NFL season. I have always doubted that assertion, or at least the absolute confidence that NFL analysts have in the assertion. The table below compares total yards per game during the first two games of the regular season to rest of the season’s total yards per game. If during the first two games of the season, the league averaged 600 yards/game and during the rest of the season the yards/game was 500, then the score would be 1.20. A score of 1.00 means there’s no difference. Are the new kickoff rules necessary? How good are the top 100 picks in the NFL Draft? NY DailyNews.com is the source of the photo. Moving the kickoff spot back to the 35-yard line, where it was before 1994, may not be necessary to ensure NFL players’ safety on kickoffs. 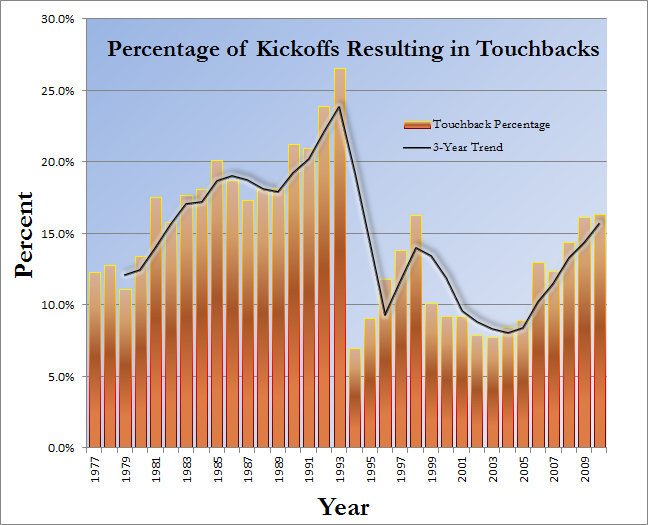 As the graph below displays, the percentage of kickoffs that ended up as touchbacks has been steadily increasing since 2003. 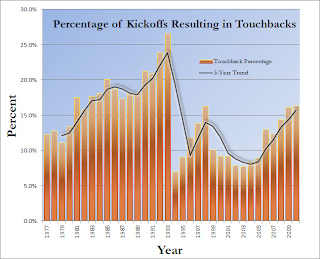 The graph also shows that the touchback percentage had increased sharply from 1977 to 1993 because the kickers, like all other players, were getting stronger. You can be sure that NFL Commissioner Paul Tagliabue noticed this trend when the league decided to push the kickoff back 5 yards to the 30-yard line. The league wanted to encourage more kickoff returns, and their wish was granted. In 1993 the touchback percentage was at a post-merger high of 26.5%; within one season it dropped precipitously to 7%. However, decrease was short lived. The percentage increased steadily through 1998 before beginning a decline in 1999, which lasted until 2004. The decline between ‘99 and ‘04 is something that surprised me. Kickers get stronger as time goes by; so maybe returners had just become bolder and more willing to run from deep in the end zone. From 2004 to the present, another era of increasing touchbacks began. Since touchbacks have been becoming more common without the new rule, the rule seems unnecessary for ensuring safety and an overreaction to the injuries that happened in 2010. The pattern is clear; kickers will continue to get stronger, which will lead to touchbacks continuing to increase and/or new kickoff strategies. (Click Chart to Enlarge) This is the second part of a four-part series in which I will try to compare parity in NBA, NFL, and MLB. The proxy for parity in this series will be “the ability of the cellar-dwellers to improve next year”. I won’t concentrate as much on the year-to-year improvement as I will on the 5-year average because the 5-year average is a more stable and shows a trend. To create this chart I looked at the worst 5 teams in the league for each season from 1980 to 2009 and calculated the average improvement of those teams in the following season. 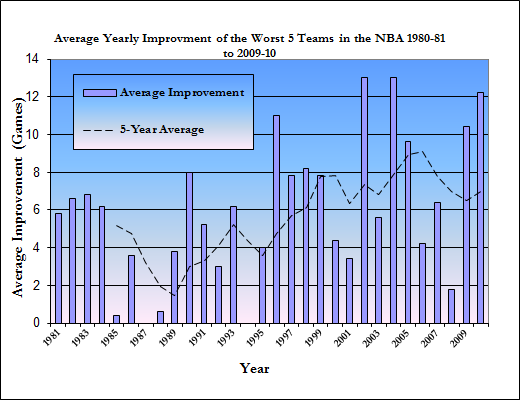 For example, in 1997 season the worst 5 teams improved by an average of 16 games from the previous season. The graph shows that the teams’ abilities to improve increased steadily until it peaked in 1993. It has since been on the decline until recently. Since 2003 the improvement has jumped up and down, but stayed in the same range. There are several possible reasons for the steady decrease in the bad teams’ ability to improve. I think the main reason is that beginning around 1993, with the Barry Bonds and Greg Maddux contracts, the growth in players salaries seemed to increase exponentially more than the growth in team revenues. When that happened, the large market teams began to have a distinct advantage in acquiring superstar players. The future does look bright for the smaller-market teams; the worst year for improvement since 1981 was 2010. (Click Graph to Enlarge) This is the first part of a four-part series in which I will try to compare parity in NBA, NFL, and MLB. The proxy for parity in this series will be “the ability of the cellar-dwellers to improve next year”. I won’t concentrate as much on the year-to-year improvement as I will on the 5-year average because the 5-year average is a more stable and shows a trend. To create this chart I looked at the worst 5 teams in the league for each season from 1980-81 to 2009-10 and calculated the average improvement of those teams in the following season. 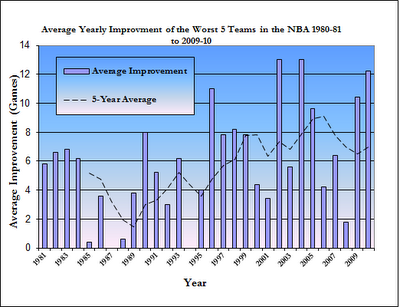 For example, in 1994-95 season the worst 5 teams improved by an average of 4 games from the previous season. The graph shows that the teams’ abilities to improve increased steadily until it peaked during the 2006-07 season; since then it has been on the decline. There are several possible reasons for the steady increase in the bad teams’ ability to improve, one reason could be improved draft scouting and increased draft depth. NFL Draft: How Good Were The Top 100 Picks? The NFL Draft is fast approaching; there is no better time of the year to analyze the overall draft performance of the league and the relationship between draft position in NFL success. In order to quantify the league’s draft performance, I analyzed the 20 drafts from 1987-2006. The study was limited to 20 years because it was big enough to be a sufficient sample size yet small enough to be completed in a short period of time. 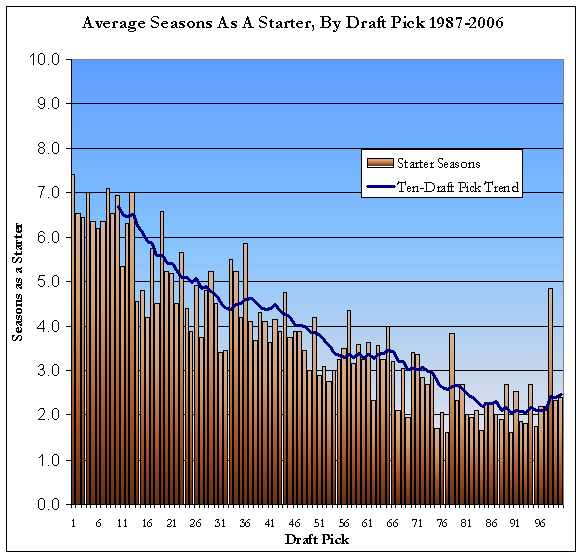 Drafts after 2006 were not used because it is often difficult to analyze a draft at less than 5 years later. The metric used to measure the draftee’s value and subsequently, the league’s drafting ability was “number of seasons in which the player was the primary starter at his position”; it’s a stat that I found at ProFootball-Reference.com. This stat would not work well in comparing one player to another, but when comparing one set of 100 players to another set of another 100 players, it is probably the best measure to use. (Even when taking into account that kickers and punters have the longest careers). Draft position is a surprisingly good predictor of player quality. I thought it was a good predictor through the first 30 picks or so, but it is actually a great predictor through 80-90 drafts picks. The graph below shows the average number of years as a starter for the first 100 picks of the draft. The important measure here is the Ten-Pick Moving Average; anything can happen from one pick to another, but the top 10 picks are almost always better than the next 10 picks, the second ten picks are almost always better than the next ten and so on. 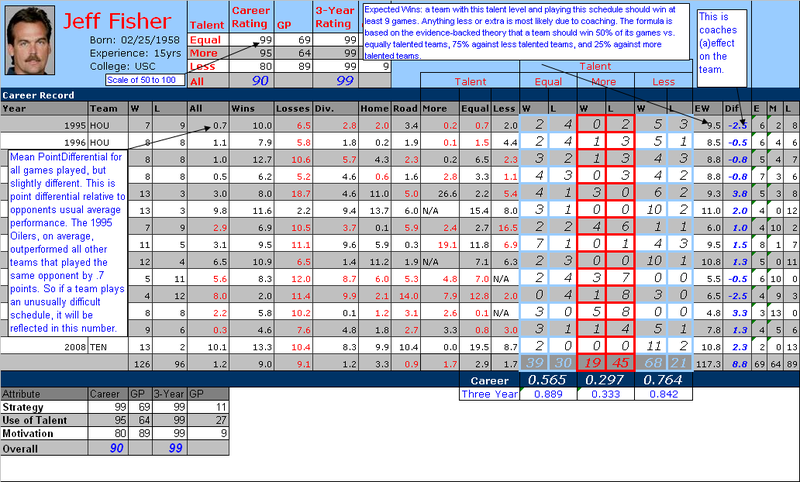 Any fan would expect the further down in the draft you go, it’s less likely that you’re going to find starter material. Although there is a downward trend as the draft progresses, this downward trend decreases at a slower rate, suggesting that difference between successive draft picks becomes smaller as the draft goes on. than draft picks 37-97. It doesn’t suggest that a team wants to pick 98th over 37th, but it is an interesting, quirky stat. The next graph uses the same attribute, seasons as a starter, to measure the NFL’s overall drafting effectiveness. It takes the top 100 draft picks as measured by total seasons as a starter, and the top 100 draft picks in the order they were picked and measures the relationship between the two in terms of percentage. The logic behind it is simple, even if the prior explanation seems convoluted. It basically measures how many of the top 100 picks ended up being one of the top 100 players in the draft class. Here’s an example to illustrate the measure: In 1987, the top 100 picks totaled 358 seasons as a starter while the 100 players with the most seasons a starter had a total of 607; this translated to the top 100 picks having 59% of the total seasons as a starter. This graph shows that in the last season of this study, 2006, NFL front offices did their worst job scouting and drafting since 1990. Which Teams Got The Most Value From Their Draft Picks? (1997-2006) Top 100 Picks From Each Draft. The adjacent table uses the aforementioned “seasons as a starter” metric to measure how much value a team received from its draft pick. On this scale 75 is average; it very closely resembles grades given at school, i.e. 80 is a B, 90 is an A. The table only measures draft picking ability. The team’s ability to keep their draft picks. The team’s ability to trade for multiple picks. Any draft picks after 100th. Cleveland and Houston were not included; they weren’t in the league for the full ten-year period, having entered into the league in 1999 and 2002, respectively. Don’t be fooled by the Patriots low score; this table only counts the picks 1-100, therefore no Tom Brady. The Patriots, under Belichick, have been adept at acquiring extra picks, but the picks are usually in the later rounds.